I tell clients all the time that my job is managing expectations and encouraging perseverance in writing. Part of working with a freelance editor is expecting to be pushed outside of your manuscript comfort zone a little bit. Most writers come to me with the thought, “I am excited by my idea but I know there are several things that aren’t working. I want to learn and grow and make it better.” Maybe that writer has gotten some early feedback from critique partners about things that need tweaking. Or they’ve already done an unsuccessful submission round with agents or editors and they didn’t get the response they expected. Or maybe their manuscript isn’t meeting their own internal expectations and they just don’t know what to do about it. Enter a second pair of eyes: an editor. Sometimes this is what writing feels like. But in order to produce good work, you have to keep pushing forward with your eyes on your manuscript — not the bells and whistles of publishing success. A small percentage of writers, however, and I’ve only had this experience twice in my editorial career, are so convinced of the merits of the manuscript that they’re not looking for an editor. They are looking, I’d imagine, to get on the radar of someone even tangentially connected to the industry, and get a booster to the top. Maybe they think I will recommend them personally to agents. Maybe they think I’ll start agenting again myself for the sake of scooping up a hot project. Or maybe they just want the gold star from someone who has made a career of saying, basically, “yes” or “no” to thousands of other writers. This woman lost twenty-five years of her writing life. She clearly loved doing it, but because one voice (in a presumed position of authority) told her she wasn’t good enough, she gave up on her dream for a quarter of a century (and almost all of her adult life up until that point). People perceive me as an authority, too. And so I have made it my goal to never wield that power in a way that hurts a writer. I always provide notes that encourage writing perseverance, not kill the drive to write. Do I rave about every manuscript unequivocally, then? Absolutely not. Even excellent writers have some blind spots. So whether I’m helping a beginning writer cut fancy “said” synonyms out of their dialogue, or I’m helping an MFA-graduate with beautiful prose work on plot and overall sales hook, I try my best to do it with the dignity and respect that each writer and each manuscript deserves, for where they are in their individual journey. All that said, I still run into writers who need help managing expectations that perhaps outpace their current manuscripts. Whether those expectations are achieving success at their first writing conference, or breaking into multiplatform publishing, perhaps even neglecting common query letter tips and putting the cart before the horse in their pitch, I see this happen with writers. They’ve created websites, maybe, or products, or they’ve already self published. They have a lot to say about various awards they’ve won or endorsements they’ve gotten. There’s little talk about the manuscript, though, as if that was just an afterthought. They’ve sacrificed perseverance in writing to focus on the bells and whistles of publishing success. This sends a message to me that the writer isn’t as interested in rolling up their sleeves and working on the product itself. To me, everything but the manuscript is just noise. You can send me a t-shirt with your characters on it, or a list of testimonials from school appearances, and all that is fine and good. I’m a driven, type-A personality, too, and I have way more ideas than I have time to make them all a reality. I respect proactive people. But my only concern is the manuscript. It’s what an agent or editor will respond to. It’s what will stand out among the noise if it’s, indeed, worthwhile. I saw excitement bubbling over for a perfectly lovely client last week, and I wrote to them: “The only way to get someone excited about your work is by presenting good work, and letting it speak for itself.” It’s easy to say but very hard to do. It’s also at the very core of what I do as an editor. Every writer has a different personality, and some need more help managing expectations than others. That’s okay. My job, however, is to help put the crucial piece of that manuscript into place, and help writers create good work so that they can then present it. It’s as simple and as difficult as encouraging perseverance in writing, but, man, do I love my job. It’s all about the manuscript. 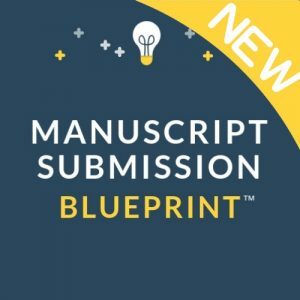 Hire my manuscript critique services and I’ll give you constructive, actionable feedback that’ll help improve your project. 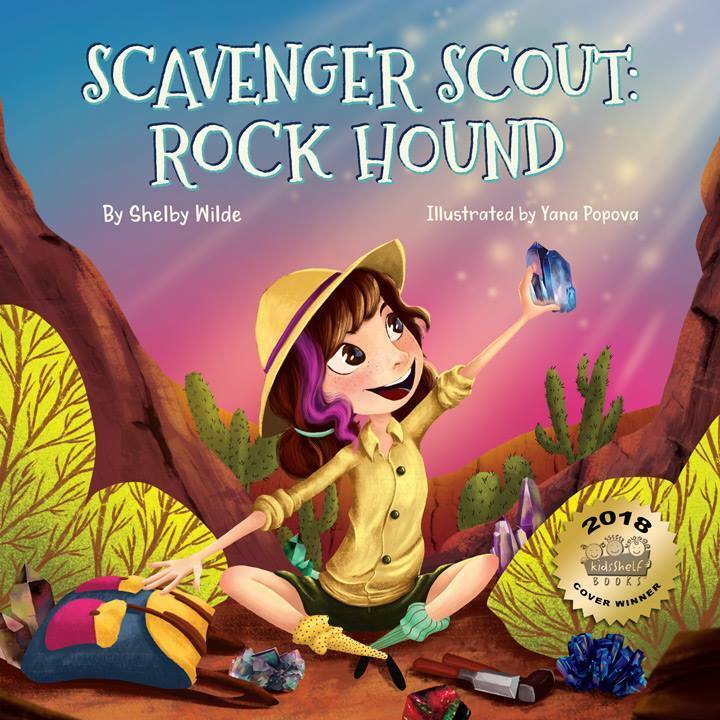 The post below is written by my editorial client Scott Plumbe, who came to me for the first time last year with a highly illustrated MG story about a fox named Theo who has some family secrets and a fascinating adventure across India and the Himalayas. It’s been really great working with Scott, and when he decided to independently release his book with a subscription model, I approached him to write a few articles about his experience. I’m sure that a lot of my readers are curious about independent publishing and Kickstarter. As a freelance editor, I’m seeing more and more clients self-publishing or pursuing alternate paths to seeing their work in print or digital release. If a guy can make tens of thousands of dollars off of a potato salad, why can’t books get funded? Here’s Scott’s first article about his process. I’ve contributed to his Kickstarter. If you’re curious, you can find the link here. The past few weeks have brought about a massive change of direction for me. I am officially starting a Kickstarter campaign. This post is the first of three in which I’ll share my crowdfunding experiences before, during and after my campaign. I’m an illustrator who has always had a desire to tell my stories through words and pictures. Comics and graphic novels may seem the obvious choice, but the complexity of my story, The Unlucky Fox, isn’t suitable for either. Instead, I’m creating an illustrated novel of 60,000 words and over 100 pages of full-colour illustrations. After much consideration, I’ve chosen to launch the story through the crowdfunding platform, Kickstarter. I’m offering potential backers a monthly subscription to the story. Every four weeks, backers receive a fresh chapter replete with newly completed illustrations. Why crowdfunding instead of other emerging or traditional avenues? Being a freelance artist who has never sought representation, I have a strong streak of DIY in me. And without that characteristic, I don’t think anyone could undertake a crowdfunding campaign. There are numerous crowdfunding options out there, including Indiegogo. I like the inherent risk aspect of KS — it’s all or nothing! If a campaign fails to meet its target, no money is collected from your backers. This prospect weeds out a lot of potential creators who are not as confident. It places those campaigns that do launch with KS amongst a community of like-minded creators and entrepreneurs. I believe the core KS users are creative types. That means artists, designers, innovators and makers — people accustomed to calculated risks. And let’s face it. As a debut writer, I’m a risk! By choosing KS and sharing the process of bringing my project to life, I hope to reduce the unknown and gain some support along the way. I took a full year to decide on my current path. During that time, I followed KS projects and undertook a major revision of my manuscript. I also sketched out a list of ideas for possible rewards and sourced suppliers. I’ve spent the last six weeks putting that plan into action. That means finalizing the rewards, writing my pitch, making the video and a website to support it all. I also poked around and made a list of blogs and local news outlets to send press releases to. Why an incremental subscription release model? From a traditional publishing perspective, as a first-time author I have many challenges. Not only is it a hurdle to promote the work of a debut author, but add on top of that my desire for accompanying colour artwork! It has taken nearly four years to bring the manuscript this close to completion, but I still have heaps of artwork to finish. I decided to take my cue from the world of comics and TV serials and break up the delivery of the story. Interestingly, some anecdotal evidence from friends in the gaming industry suggests that many game studios are moving away from the traditional Hollywood ‘tentpole’ model, pushing projects forward with incremental expansion instead. They deliver their content in small doses, rather than one big launch. Studios are taking less risk and getting instant audience feedback as they progress. In their case, the result is a product that essentially has no end and can lead to a more empowered fan base. What are your risks and challenges? I have many! Most are obvious, while others are specific to my story. In particular, the chance of not connecting with an audience is notable. The KS community is primarily adult, not the young teens my novel is written for. But encouragingly, there have been several successful campaigns for young readers. Most notably, Augie and the Green Knight that earned nearly $400,000 in pledges. Of course, this is the exception and not the rule! Well, I guess it’s time to hit LAUNCH! I’ll check back in when my campaign is underway. 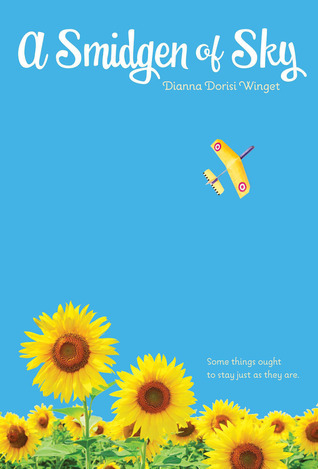 You read about this project here first, when I posted about the sale of A SMIDGEN OF SKY by Dianna Dorisi Winget (then titled Fly A Little Higher, Piper Lee) from Harcourt. 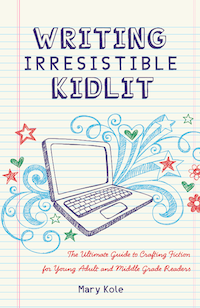 Now the moment is finally here (tomorrow) when you can read all about spunky Piper Lee in this irresistible middle grade! Order your copy and crack into this tale of growing up, dealing with change, and what it really means to be a family. Congratulations, Dianna! Happy Release to THROUGH TO YOU! 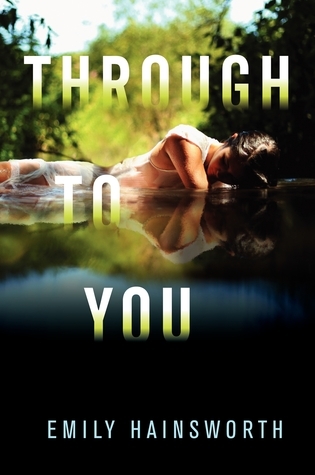 Yesterday was the release day for THROUGH TO YOU by Emily Hainsworth, a standalone young adult novel from Balzer + Bray/HarperCollins. If you aren’t curled up reading it, I’m glad you’re reading this, since it might inspire you to go and buy your copy. To learn more about how I sold THROUGH TO YOU and Emily’s journey, check out my Story of a Sale post. You can also order TTY from Amazon or Indiebound. Please feel free to review it on Goodreads. For Emily’s website, click here. I’m so very proud and excited for you all to read this amazing book! Update and Congratulations to Karsten Knight! Go out and get your copy today, er, tomorrow. If you haven’t read the series yet, you’re in luck! 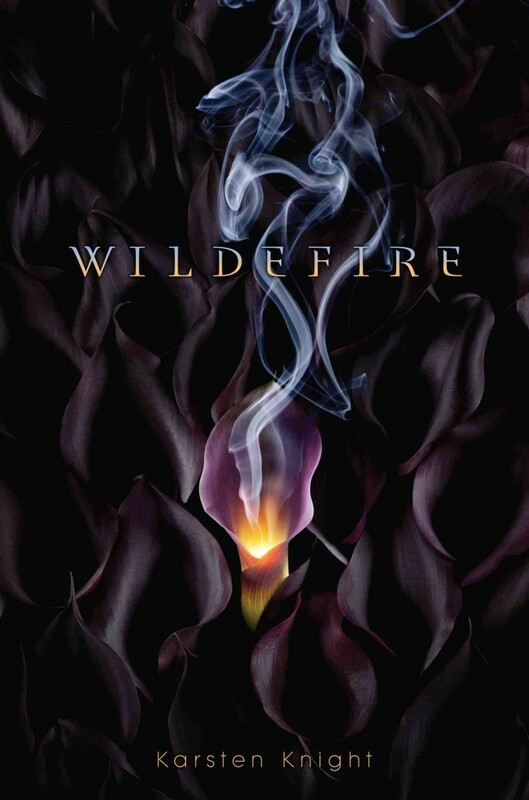 The paperback of WILDEFIRE, the first book, is also out. This is a multicultural romp that features a group of powerful teen gods and goddesses. If you’ve been looking for a good definition of voice, you should definitely be reading Karsten’s work. Good thing you can start tomorrow. Other than that, I am teaching my very popular Picture Book Craft Intensive webinar on Thursday, September 6th at 1 p.m. Eastern. As with all of my other webinars, you don’t have to be available on the time and date. You will get a recording of the lecture after the fact. The webinar comes with a critique for every student, and this is a great opportunity if you’ve been craving some professional eyes on your picture book manuscript. Register here. I’ve got a few conferences coming up. The weekend of September 15th I’m in San Antonio for the SCBWI conference, and the weekend of the 28th, I’m visiting with the Idaho Writer’s League. If I’m meeting you at either of those, I’m looking forward to it! If not and you’re nearby, please register. 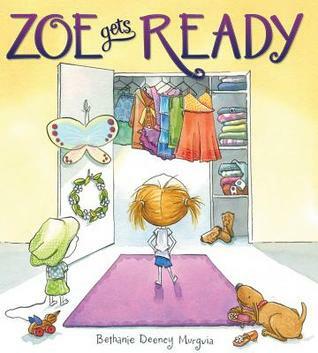 A few days ago, I posted about the amazing ZOE GETS READY by Bethanie Deeney Murguia, out now from the Arthur A. Levine imprint of Scholastic. 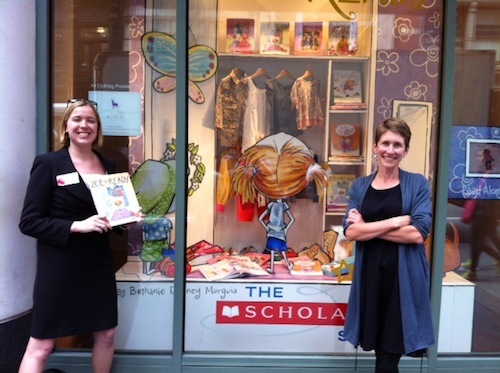 Well, in some very exciting news, Scholastic has chosen Zoe to decorate the window of the Scholastic headquarters flagship store in SoHo for the next month, right on Broadway in New York City. This was something that Bethanie Murguia simply had to see for herself, so we got together to take some pictures yesterday. She also signed stock at Books of Wonder on W 18th Street, and at the Scholastic Store itself, so if you are in the area and want a signed copy of ZOE, head on down before they’re gone. 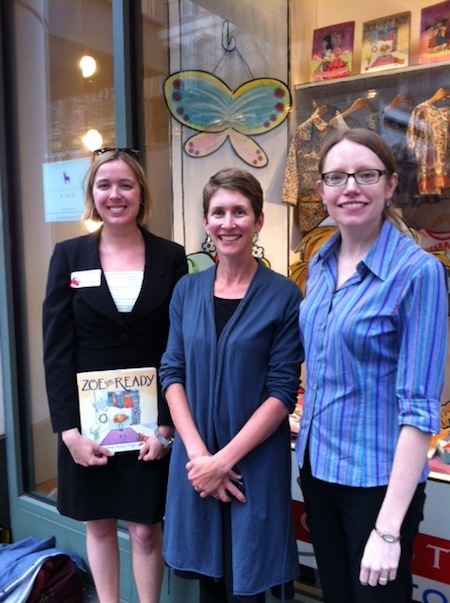 We were joined for a delightful series of meetings and for dinner by Cheryl Klein, ZOE’s editor. Scholastic even made stickers that let kids dress and redress Zoe in various outfits! Those have been sent to booksellers, so I hope you see some in the wild. The first picture is Bethanie and me in front of the window, the second is all three of us proudly showing off a copy of ZOE. What an amazing opportunity! I’m very grateful for the support of the Scholastic team, and so happy that Bethanie was able to see her work displayed with such style. A fun bit of trivia: Zoe’s closet in the window features real clothes from Stella McCartney Kids! 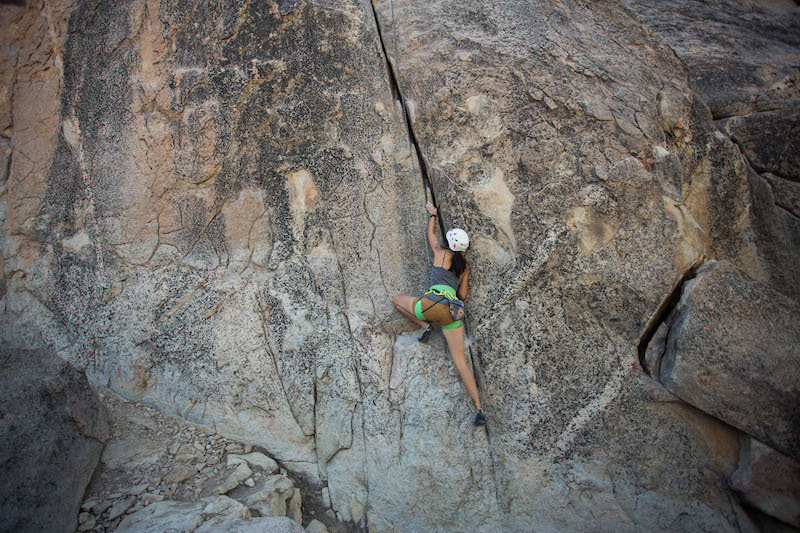 Happy Release: ZOE GETS READY and Bethanie Murguia! How completely inappropriate…I am late in announcing the release day for the amazing picture book ZOE GETS READY by Bethanie Deeney Murguia, out on May 1st from Arthur A. Levine Books/Scholastic. It’s the story of a girl with big hopes for a day when she gets to choose her own outfit. But how can she make up her mind with so many possibilities in her closet? And just what kind of day will it be? I’m going to bring you another super cool picture of the team behind ZOE this week, but for now, get on over to your local independent bookstore and pick up your copy! If you are an online shopper, find it on Amazon or Indiebound. You can check out Bethanie’s website here. And don’t worry about falling in love with this spunky heroine and being left hanging…Scholastic will publish a follow-up ZOE book next year! Congratulations WHEN BLUE MET EGG! 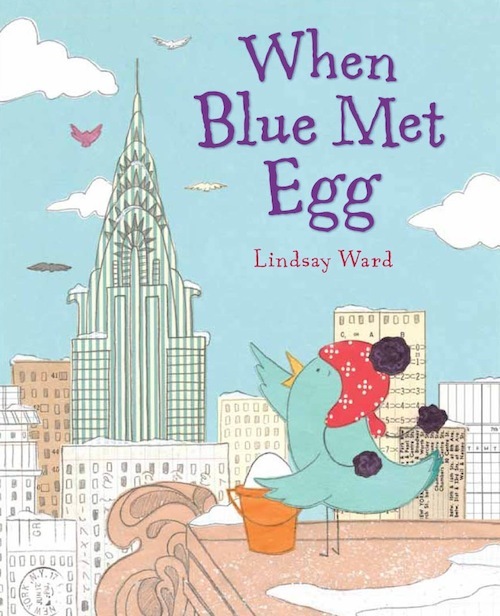 Today is a fantastic day indeed because Lindsay Ward‘s WHEN BLUE MET EGG is now on sale! This book is out from Dial, an imprint of Penguin USA. Go down to your local independent bookstore and look for it. If they don’t have it, ask for it by name. This is a gorgeous story of friendship and love, loss and acceptance, and it takes place against the snowy backdrop of one of my favorite places in the world: New York, New York! Meet Blue and Egg and follow their adventures today. You can also read the story of how this sale came about here. I’m thrilled to tell you about the official release day of WILDEFIRE by Karsten Knight today! Pick it up right this minute wherever books are sold, or order it from Indiebound or Amazon. Now, behold the cover in all its glory, and head on over to Karsten’s website to help him celebrate. 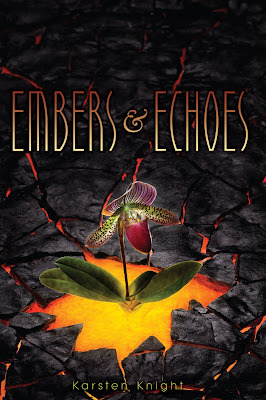 As we just announced last week, WILDEFIRE will have two follow-up books: EMBERS & ECHOES and AFTERGLOW, both from Simon & Schuster. Heat up your summer with this sizzling read.